This day, we headed out bright and not-so-early to Nishiki Market. This was going to be our brunch spot. We had a strategy - try lots of stuff until we were stuffed. Nishiki Market is an easy 5-minute walk from Shijo station. The market is basically one street of about 500m, with stalls on both sides selling anything from fresh seafood and snacks to fruit and vegetables, flowers and souvenirs. There's so much to see, it took us about 2 hours just to complete our round of the market. 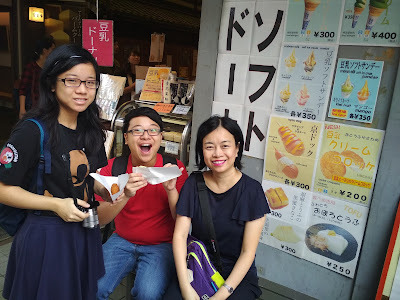 One of the first things we ate at the market was a soy bean cream croquette. We weren't expecting much since this was one of the first few stalls we came to (you know the old wives' tale - better quality and bargains further in!). Boy, were we wrong. The croquette was absolutely divine - so smooth, creamy and tasty. It's possibly the best croquette we've ever tasted and leaves regular potato croquettes in the dust. We went back and bought four more. Some other things we tried: grilled eel and eel tempura from a stall that specialised in conger pike eel. Thick, fluffy rolled omelette. This is the savoury version, not the sweet type you tend to get on your sushi. Octopus stuffed with a quail egg. Grilled scallop in butter sauce that the stallholder sears on the spot. This was another item so delicious that we returned for another. Crispy rice cracker that comes in a multitude of flavours. Andre ordered a grape mochi that didn't look like much, but it actually contained two whole grapes! It was so sweet and succulent that he had to have another. A couple of things to note: first, eating at Nishiki Market is not cheap once you add up the costs for all the small bites of food, so be prepared. You probably won't get full unless you're prepared to spend a lot, but it's a great opportunity to try lots of different food. Two, when buying street food, you might be used to eating it on the go but in Japan, it's polite to eat what you buy next to or in the stall you bought it from, finishing it before moving on. Most of the stalls only have a little space inside or on the side with a couple of makeshift chairs. Enough to sit down for a little while and enjoy your snack. After so much eating, we decided to imbibe in a little culture by going to Nijo-jo Castle. If you have your Kansai One Pass ICOCA card, you pay only Y500 instead of Y600 for the entry ticket. Built in 1603 during the Edo Period, it served as a home and office for the shogun. What I found fascinating about the palace were the nightingale floors, named because they "sang" like birds when you stepped on them due to the way the nails were placed. According to Andre, he said the floors were built this way to prevent assassins from sneaking past the floors to their targets at night. It really did sound like birds singing! Photography is not allowed in the palace. This is outside the palace. The castle grounds are very picturesque. I can imagine how pretty it must be during autumn when the leaves change colour. Unfortunately for us, it was still summer so it got rather warm and there wasn't much shade except at the rest areas. We were pretty tired after walking the castle grounds, so we took a cab back to the hotel. Tip: if you're a family of four, it may make more sense to take a cab instead of a train, especially for short distances. The fare for our trip from Nijo-jo Castle to RIHGA Royal Hotel was Y1,500 (about S$18). If we had taken a train to Kyoto statioin, it would have cost us Y1,040, so it's just a little less. After a couple of hours' rest at the hotel, we took the hotel shuttle bus to Kyoto station for dinner, which was at Edogawa, an eel restaurant. The restaurant is located on the south west side of the station. Since they specialise in eel, we ordered eel - four sets of it. If you want our honest opinion, the eel was good, but it didn't taste very different from the ones you can get back home in Singapore. Nevertheless, it was a tasty meal. After that, we went to Isetan to hunt for some fruit. There's a huge Isetan in Kyoto station - 11 floors with two basement levels of food. We quickly discovered that fruit is crazy expensive in Japan. Most fruit is sold singly, even bananas. An apple for Y200 (about S$2.50)! It must cost a bomb trying to get two servings of fruit here. We decided to splurge on some massive high end black grapes at Y980 a punnet. I've never bought grapes so precious that they come bubble-wrapped! They're large and very sweet, with a wine-like quality. We also bought a pack of three Chinese pears, so large that we could share one among the four of us. A cheaper alternative to Isetan supermarket is Harves, located at the south west side of Kyoto station, ground floor. It offers fruit, dairy, drinks, snacks, even a small selection of ready-to-eat food at reasonable prices. Kyoto station really is a great place to stay close to - you can find anything here.